Pacific Power Group has engineered a propulsion system with an exhaust treatment system for two new San Francisco Water Emergency Transportation Authority (WETA) ferries that will be the cleanest operating passenger ferries in the U.S.
Third party independent emissions testing completed in January at PPG’s Kent, Wash. location show that the system’s emissions are believed to be lower than any currently-operating passenger ferry in the U.S. The MTU engines are certified to EPA Tier 3 marine emission levels and with the added exhaust after-treatment system, EPA Tier 4 Final level performance is achieved without the use of diesel particulate filters. The independent emissions tests were conducted and verified by Infowedge and The University of California at Riverside Center for Environmental Research and Technology. PPG’s custom-engineered solution focused on the operating conditions with the greatest emissions outputs with a high priority on vessel operational reliability and keeping weight and space claim to a minimum. The system will reduce an estimated 10 tons of NOx, PM and CO emissions annually through the use of selective catalytic reduction and diesel oxidation catalyst technologies. 12V4000M64 1950 HP engines and ZF 7600 reduction gears. MTU Series 4000 engines provide a clean-running operation that helps lower the ferries’ emissions output. The Series 4000 engines also offer increased safety, lower fuel consumption and greater reliability for the commercial passenger vessels. PPG’s engineers worked closely with Vigor Industrial’s Kvichak Marine Industries to develop a system that physically fits the vessel design, meets weight goals and provides easy installation and maintenance for WETA. The ferries will replace two of WETA’s 12-vessel fleet that are nearing the end of their expected 25-year life. Each vessel will carry approximately 400 passengers and will operate at about 27 knots. 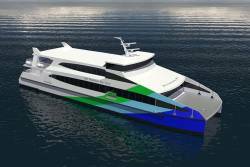 Designed by Incat Crowther, each will be a 135’ x 38’ all-aluminum catamaran. The ferries are currently under construction at Kvichak’s shipyard and are expected to be in service by the summer of 2017. PPG is a longtime partner of WETA, and has provided propulsion systems, support and ground-breaking environmental solutions for the transit organization for many years. In 2011, Pacific Power Group supplied advanced propulsion systems for WETA’s Gemini and Pisces ferries that exceeded then-current EPA Tier 2 standards by 97 percent.